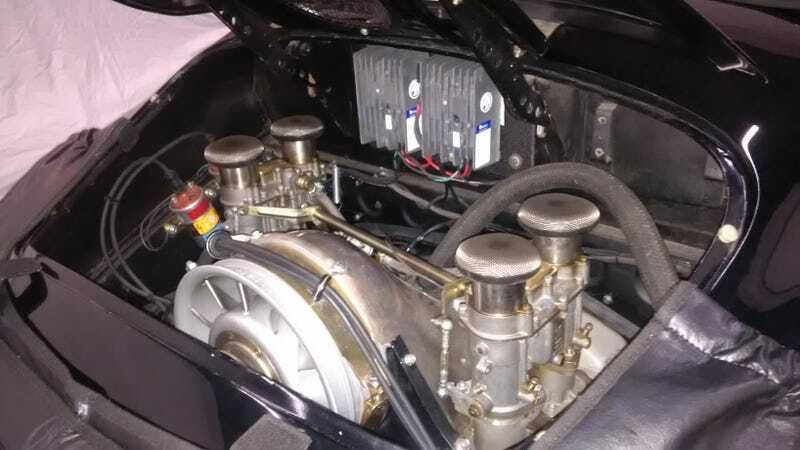 993 3.6 motor, truncated to 4 cylinders and sprinkled with some 3.8 goodies, shoehorned into a ‘56 Speedster- with 944 suspension and steering, big brakes behind Chip Foose-designed 1 off wheels, a widened rear to accommodate them, along with a 914 (early 911) transaxle that needed a rebuild. I got to be an extra hand dropping the drivetrain and observed the transmission rebuild but only got there in time to button some minor finishing touches together today. Quite a price tag on this one but it sure was neat to see its guts spilled!